With more than 50 years’ experience in providing custom-built, high reliability, precision instrumentation to customers from a diverse range of global markets, Reliance Precision Ltd is a specialist engineering company that enjoys a global reputation. The company supplies to industries with highly demanding requirements, including the medical, scientific, laboratory automation, defence, aerospace and space sectors. In addition to offering standard, ex-stock precision motion control components and electro-mechanical assemblies that feature in the company’s catalogue, Reliance provide custom-designed and manufactured sub-systems, and even complete instruments. In-house engineering capabilities include design, development, prototyping, manufacturing, assembly and test. Reliance’s component manufacturing capability extends across a full range of CNC machinery, including high speed machining centres, 5-axis machining, jig boring, sliding head one hit machining and Gear-cutting. In addition, the company has specialist expertise in centreless grinding, rack grinding and the grinding of hard material. A policy of sustained investment in leading edge equipment has allowed Reliance to maintain and continuously improve its capabilities. 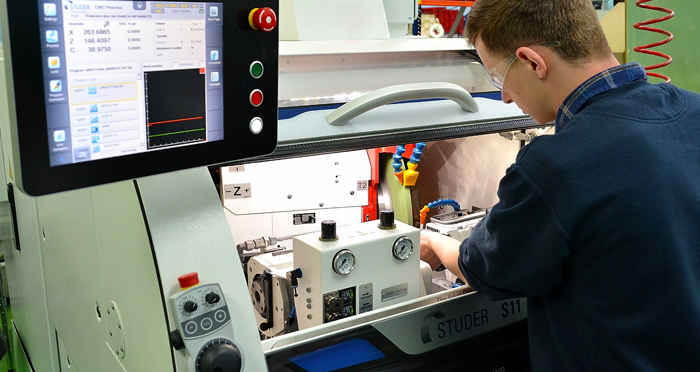 Typical of the company’s philosophy of purchasing the best available production equipment was the recent purchase of a Studer S11 CNC cylindrical grinder. Alex Greenhalgh, Reliance’s Estimating Manager explained. “The nature of the challenging sectors that we serve, and the kind of demanding high-precision work that we undertake dictates that we invest in only technically superior machine tools. “A growing workload, especially for small parts with challenging accuracy specifications, recently demanded that we searched for an additional CNC cylindrical grinding machine. To ensure that we purchased the optimum machine for our needs we did an analysis of factors such as the size, shape and the accuracy requirements of the grinding work that we had completed over the past 5 years. The results of this study allowed us to prepare our ideal machine specification. “As we are aware of Studer’s excellent reputation and given that our 40 year old Studer grinder is still working perfectly, we have a natural bias towards the brand. Although, as technical progress is constantly taking place in the field, in addition to considering the most suitable Studer grinder for our needs, we also looked at alternatives from other leading manufacturers. “Although a couple of the options we thought about had some of the features we were looking for, the Studer S11 was the only compact CNC cylindrical grinding machine that met, and in some areas exceeded our technical wish-list. To verify the machine’s suitability, we sent 2 of our Grinding Team to Studer’s Swiss HQ to witness in-depth machining trials. Having confirmed the S11’s advanced capabilities, we were happy to place an order. The S11 boasts a Granitan® S103 mineral-casting machine base that exhibits excellent dampening characteristics and ensures outstanding surface quality of ground workpieces. The use of this advanced, thermally stable material also compensates for temporary temperature fluctuations, resulting in high dimensional accuracy. The advantageous properties of Granitan® also increase the life of grinding wheels. Highly dynamic axis drives, high-quality STUDER guideway systems, short reaction times and optimized traverses form the basis of the S11. The high-speed grinding option (HSG) contributes to increasing productivity with its peripheral speed of up to 140 m/s. With a floor space requirement of less than 1.8 m2, the S11 is extremely compact and will fit into any workshop. As additional advantage is that the S11 does not need hydraulics. The machine’s precision is the result of the perfect interaction between a large number of different factors, all machine modules are ideally suited to each other and produced with customary STUDER precision. X and Z-axis are designed as a cross slide, and the workpiece table is bolted permanently to the machine. This Studer cross-slide system has been proven for many years on production cylindrical grinding machines. High-precision guideway systems and dynamic axis drives, in conjunction with a robust design guarantee high process reliability in production. The machine’s wheelhead is available with a plunge angle of 0 or 20 deg. The motor spindle, with a hollow shaft and integrated contact detection and balancing unit, makes a large contribution to the legendary Studer precision. With its high-precision roller bearings the S11’s workhead is used for grinding between fixed centres and for live spindle grinding. The powerful workhead spindle has a MT4 fitting taper. The machine’s airlift simplifies adjustment when setting up or resetting the workhead, whilst fine adjustment enables taper corrections in the μm-range during live spindle grinding. The S11’s rigid tailstock with generously dimensioned barrel is extremely stable and guarantees optimum grinding conditions for grinding between centres. The barrel slides in effectively covered floating bearings. Fine adjustment enables taper corrections in the range below 1 μm when grinding between centres. An easy-cutting grinding wheel is essential for cost- effective, high-quality grinding. In order to create a flexible and optimal dressing process that coordinates with the properties of the workpiece, tool and materials, STUDER provides a large selection of dressing units. The grinding wheel profile and dressing parameters are easily defined via macros. Another STUDER speciality is the grinding wheel reference points (T-numbers). This enables programming with normal dimensions, which facilitates the development of grinding programs. A software package is available to fine tune the dressing process and includes additional dressing functions. The clear and ergonomic arrangement of the S11’s Siemens Sinumerik 840D SL control further guarantees efficient operation. The projective-capacitive touchscreen, with continuous glass plate over the entire panel, is resistant to scratches and dirt. An important role is played by the manual control unit, which facilitates setup close to the grinding process. The StuderWINfocus operator interface, based on the tried and tested StuderWIN, creates a stable programming environment and contributes to the efficient use of the machine. StuderPictogramming: The operator strings the individual grinding functions together – the control unit generates the ISO code. Microfunctions: Free programming of grinding and dressing process sequences for optimization of the grinding process. The integrated basic value computer for technological calculations assists the programmer in grinding technology calculations. As the S11 is designed as an efficient production grinding system, the choice of loading and unloading systems is accordingly large. The machine can be loaded from both sides and several machines can be linking together. Comprehensive quality control is possible during the grinding process. This entails: in-process, and post-process measuring, recording, evaluation and correction. The S11 has a compact design, nevertheless, accessibility is guaranteed at all times. A sliding door perfectly designed for manual loading can be fully opened for set-up and enables optimal access to the workhead and tailstock area. Service doors on the left and right ensure perfect accessibility. Pneumatic components are integrated into the machine bed so that they are clear and easily accessible.